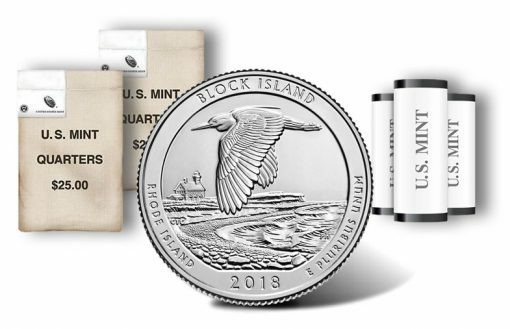 Appearing as the last new quarter dollar from the United States Mint in 2018 is the coin honoring Block Island National Wildlife Refuge of Rhode Island. Block Island quarters launched today in 40-coin rolls and 100-coin bags with varied options available by production facility. Each roll or bag product contains circulation quality quarters from the U.S. Mint’s facilities in Philadelphia, Denver or San Francisco. These coins were taken directly from plant manufacturing floors so they have actually never circulated. Above is a CoinNews photo of the five 2018 America the Beautiful Quarters. These coins are proof editions that launched in a collector set earlier this year. Block Island National Wildlife Refuge was established in 1973 and consists of 127 acres near New Shoreham, Rhode Island. The refuge traditionally hosts over 70 species of migratory songbirds each fall. Shown on the reverse (tails side) of the quarter dollar is a scene emblematic of the wildlife refuge. This design, created by Chris Costello and sculpted by Phebe Hemphill, was selected from among twelve design candidates. In the following U.S. Mint video, Hemphill talks briefly about her work on the quarter. All coins of the America the Beautiful series offer the same obverse (heads side) image — namely, the John Flanagan portrait of George Washington, the first President of the United States. The effigy has been seen on quarter obverses since 1932. Inscriptions around Washington read "UNITED STATES OF AMERICA," "LIBERTY," "IN GOD WE TRUST," and "QUARTER DOLLAR." A mintmark can also be located on the obverse with ‘P,’ ‘D,’ or ‘S’ indicating Philadelphia, Denver or San Francisco. 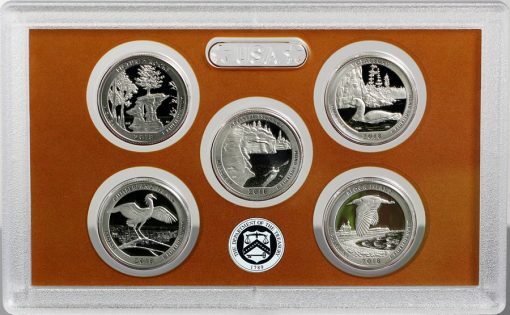 The U.S. Mint has six quarter product options. All include 100-coin bags ($25 face value per bag) or 40-coin rolls ($10 face value per roll). As the chart indicates, buyers may choose from quarters produced in Philadelphia, Denver or San Francisco. Quarters from San Francisco are issued for numismatic purposes and only available in products such as these bags and rolls. Block Island quarters from Denver and Philadelphia will eventually appear in change. America the Beautiful quarter dollars are available from the U.S. Mint’s website page dedicated to the series located here. They may also be ordered by calling the U.S. Mint at 1-800-USA-MINT (872-6468). An official launch ceremony for the Block Island quarter will be hosted by U.S. Mint and U.S. Fish and Wildlife Service officials. The event is scheduled for Thursday, Nov. 15, 2018, at 10:30 a.m. (ET). Of note, parking for the event is located at Ninigret Park, Rte. 1A, Park Lane, Charlestown, RI 02813. Shuttles will be provided from 9:00 am to 10:15 am and following the ceremony. Officials recommend appropriate clothing be worn for the outside tent event. Attendees of the ceremony will be offered the opportunity to exchange $10 cash for a roll of the Block Island Quarter. The previous evening, from 5 p.m. to 5:30 p.m., the U.S. Mint will hold a special coin forum where guests can ask questions of Mint officials. The forum will be hosted at the Rhode Island National Wildlife Refuge Headquarters Kettle Pond Visitor Center. The Mint’s America the Beautiful series debuted in 2010 and is scheduled to run until 2021. At its conclusion, a total of fifty-six quarter dollars will have been issued. 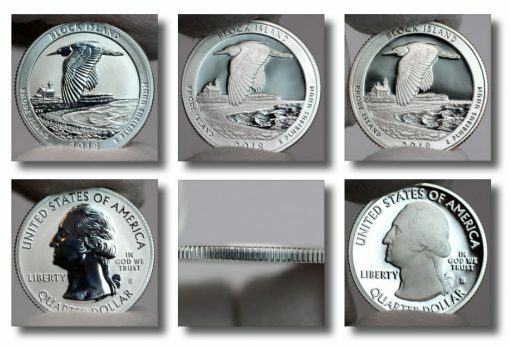 The U.S. Mint also produces five ounce silver coins bearing the same basic designs as the new quarter dollars. Five ounce coins are struck from .999 fine silver and have a diameter of 3 inches. Options include bullion and uncirculated versions. Bullion coins are sold through the Mint’s network of authorized purchasers. They may be purchased from coin and precious metal dealers for a small premium above the melt value of each. Uncirculated coins are sold directly to the public by the U.S. Mint. The Block Island Five Ounce Silver Uncirculated Coin launches on Nov. 15 for $154.95.